Throughout his life, John Latham, 1921–2006, England’s most controversial conceptual artist, periodically visited Scotland. Briefly, during the summer of 1964, he and Alexander Trocchi stayed with Edinburgh bookshop owner and co-founder of the Traverse theatre, Jim Haynes. He spoke at Edinburgh College of Art’s Participation Art, 1972, accompanied by fellow artist Barbara Steveni, his wife and enthusiastic collaborator. But it was the 1975–6 Artist Placement Group (APG) which enabled him to work on a still enduring project, taking up the role of ‘Incidental Person’ alongside civil servants at the Scottish Office’s Development Agency. As is often the case with the best of artists, Latham’s catalytic concepts were without limits; all of life was an opportunity to make art. However, entertaining mythologies appear to stem from Latham’s tendency to extreme extrapolation, at the cost of serious engagement with the historically important aspects of his practice. And yet, who else could persuade both England’s greatest pop artist Richard Hamilton and greatest pop scientist Stephen Hawking to write introductory catalogue essays for him? Or perform an intellectual overpowering of Joseph Beuys during Documenta 6. Latham’s contribution to multi-media environments such as Gustav Metzger’s Destruction in Art Symposium is notable in 1960s art history, although it is difficult to identify the artwork clearly from its contextual process. An English intellectual, he detested perpetual authority and its ‘despotic or benevolent priesthood’. ‘Truth’, he argued, was always incomplete. Obscure, oddly spiritual in attempting to exploit the meaning of God, he is often compared to Blake, his work ‘The Mysterious Being Known As God Is an Atemporal Score, With a Probable Time Base in the Region of 1,019 Seconds’, 2005, being a contemporary example. He beckoned controversy; institutional dismissal (from St Martins School of Art, London) followed the infamous book mastication ‘Still and Chew/Art and Culture’, 1966–67. Jeff Nuttall’s 1968 Bomb Culture chronicles an Oxfordshire weekend gathering including Latham, Trocchi, Tom McGrath and RD Laing during which, depending on the many perspectives purveyed, Latham either vandalised the host’s living-room or created the first in a series of thought-provoking artworks incorporating books. Affixing his host’s prized 1916 volume The Brook Kerith by George Moore to the wall and spraying black paint over it, labelled him as from ‘another planet’. Other-worldly? Yes, but smart too and very busy. And so with Steveni, he could be found in a permanent state of devising, demanding, invention. Even his wedding ceremony led to introductions to scientists Gregory and Kohsen, with whom his time-based theory was later determined. Aside from the occasional distraction of gardening—the link between nature and physics in his work is unexplored—‘everything turned into a meeting’, as recalled by Ian Breakwell. Imagine then, further meetings, say, between his lodger Yoko Ono and near neighbours Mark Boyle and Joan Hills, the Scottish artists with whom early plans to encourage industry to pay for artists were realised in time as the Artist Placement Group (APG). Latham’s placement at the Scottish Office’s Development Agency grew out of APG’s well-rehearsed methods to position artists within industrial, governmental or administrative settings. Sweeping aside myths that obscure the social division of labour and renaming the artist as an ‘Incidental Person’, APG’s projects focussed on the artist’s ‘generalist’ status. Armed with an open brief, the ‘Incidental Person’ was allowed free interaction with few expectations of how their role might develop except, in civil servant Derek Lyddon’s words, ‘the hope that his creative intelligence or imagination can spark off ideas, possibilities and actions’. As Latham, and others, were fond of saying, ‘the context is half the work’. APG contexts ranged widely, all masterfully co-ordinated by Steveni, from projects within the fishing industry to Ian Breakwell’s ground-breaking work in mental healthcare. The ‘Incidental Person’s’ contract might involve direction from the host, who paid the salaries, and conclude with longer-term proposals known as the ‘Feasibility Study’, leading hopefully to further work realised by mutual agreement. Latham’s funded three month placement book-ended between October 1975–March 1976, during a critical period of international retrospectives of his work. As agreed, his SDA ‘Feasibility Study’ was to address ‘Urban Renewal, Derelict Land and Graphics Group’. Thus it came to be asked during his introductory 1975 in-post committee meeting at the Scottish Office, ‘is the artist going to solve problems?’. To which the responsible civil servant Lyddon rightly responded, ‘No, the artist is going to show us problems we didn’t know were there.’ Latham did solve problems in unexpected ways. When asked at the Scottish Office ‘from which perspective would he be looking at Scotland’, he pointed to an office map of Scotland and said ‘from this distance’. Aerial perspectives and the compression of time/distance were a common feature of Latham’s artwork. 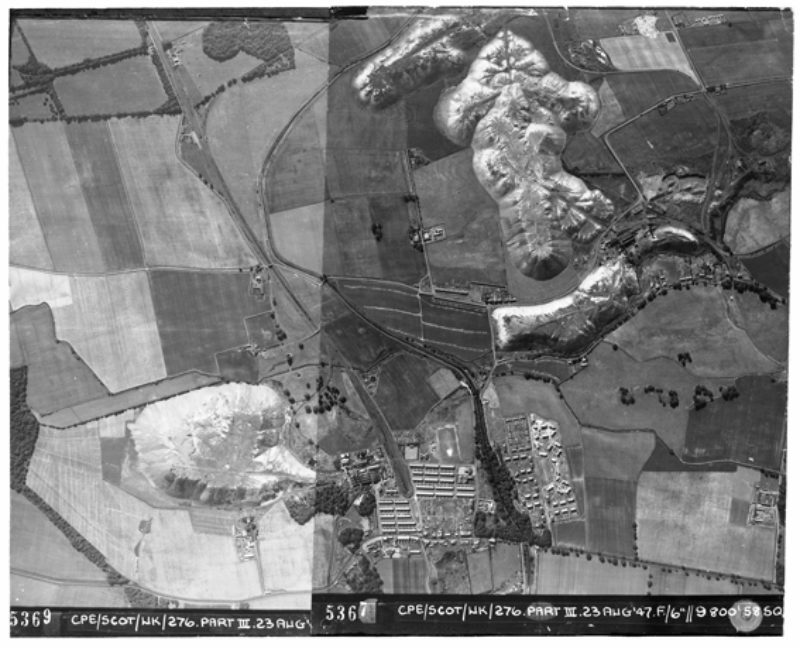 During his placement an initial study of the overwhelming aerial photography archive in the Graphics Group’s ‘air photo library’ resulted in subsequent extensive proposals for the preservation of spoil heaps on derelict land which covered 22,000 acres in Scotland at this time. When viewed from above through aerial records Latham determined that the West Lothian shale bing Greendykes and adjoining bings, which originated from a mid-19th century process of distilling crude oil from shale for use as paraffin, lent themselves to a visual comparison as ‘a modern variant of Celtic Legend, namely NIDDRIE WOMAN’ and formed ‘an historic document of the century’ citing Skara Brae and Callanish. Acting less as cartographer and more as psychogeographer in awe of these forms, Latham’s ‘Feasibility Study’ developed proposals relating to the preservation and development of a collection of bings. These bings, known as Greendykes, Faucheldean and Niddry (sic), are located in Broxburn’s largely agricultural areas in West Lothian near the M8 motorway and also further west, where the Westwood bing, known as Five Sisters, is located. Re-conceived by Latham as monumental process sculptures, ‘monuments to the period we live in’, as attested to in later interviews and major exhibitions, they are central to the further understanding of Latham’s life’s work and death, and important to post-war conceptual art in Scotland. The Scottish Office did not initially believe Latham was ‘the right person’ for their offices. But Steveni retorted he was ‘our boffin’. Whatever the compelling reasons by the time it came to the selection, Latham insisted it could be him and no other. But the National Coal Board, which had previously sponsored an Incidental Person Placement, found Latham’s photographs and subsequent 16mm film ‘Erth’ (sic), 1971, to be rather less than they expected, perhaps because of its baffling periods of silence and blackness. 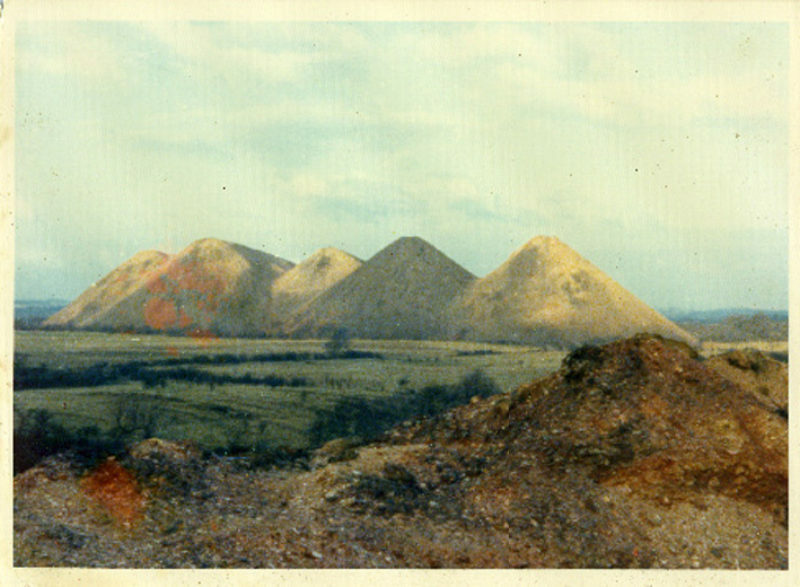 Associated APG archives show Latham’s identification of UK-wide mining operations, as well as unrealised proposals to make a grass sculpture on a Northamptonshire spoil heap. He also retrospectively arranged the Tate’s ‘Derelict Land Art: Five Sisters’, 1976, a series of Rita Donagh’s photographic studies of the bings following Latham’s instructions accompanied by a jar of shale. These are rather lacklustre in comparison to the emotive quality of his ‘Feasibility Study’, later expertly summarised by Derek Lyddon, which ran to 36 plastic folders each containing two sides of illustrations and detailed commentary. This is undoubtedly an artwork of outstanding merit and ought to be given important status within Latham’s oeuvre. As well as extensive proposals for derelict shale bings, the study includes photographs and drawings forming further proposals for sea cultivation, nuclear energy, and local community application of video broadcast technology. Rather than assuming that the re-conceptualisation of the bings could be maintained without significant markers, Latham’s study proposed simple markers such as steps or notice-boards alongside the preparation of historical records of the sites and further artist’s placements. Latham also proposed that Niddrie Woman should incorporate more recognisable forms of environmental renewal through artworks, rightly citing Finlay’s garden, Stony Path, which became ‘Little Sparta’, as the exemplar in this area. While accepting the persuasive argument that identified bings be preserved as monuments, the civil servants rejected Latham’s further proposals for Niddrie Woman, including a towering, intersecting book-like sculpture ‘Handbook of Reason’, which some considered to resemble a large cruciform. The cost implications for this remain unknown but this decision is rather saddening given the poor quality of contextually derived meanings resident at the public artworks which have appeared along the M8 corridor since 1993. Latham’s ‘Feasibility Study’s’ small photographs and sketches, as well as a related maquette and some retrospectively-titled artworks, give repeated glimpses of the dynamic quality such a towering monument could have brought to the site, were it engineered. However Latham’s placement, as recorded by the resident civil servants, did instil a sense of respectful curiosity and engagement with the aesthetic content of his proposals, and formed timely, influential and persuasive arguments around the the status of these previously regarded shameful eyesores. Recognition of some bings as ‘monuments’ within the context of art and their evolutionary status subsequent to Latham’s placement is highly important. Latham realised, and the Scottish civil servants accepted as much in subsequent committee minutes, that political or civic recommendation does not by itself result in meaning as art. Art’s institutional recognition of the bings’ special nature came through the Tate’s then director Sir Norman Reid—his childhood relationship with their geography might have influenced this decision. However, Latham and Steveni maintained a shared civic responsibility for the bings’ potential status as artworks. The pair’s extensive lobbying included irritated communication with the civil servants who had hosted the initial placement and to influential political and cultural people such as Tony Benn. While the effectiveness of Latham’s ‘Feasibility Study’ is not widely known, it is important that to recognise Latham’s designation of the five separate sites in Lothian which he considered held ‘great dignity of aspect’. He held that Niddrie Woman spoke ‘for Scotland round the world’ as ‘a contemporary statement of the universal condition’. Confusingly prone to arguments that a percentage of Five Sisters’ monetary value was now due to him, could it also be that Latham considered them monuments through an extrapolated argument which others in officialdom did not hold or even understand? The Scottish Office invitation to reiterate the case for their ‘monumental’ nature at a crucial moment in the bings evolving status (the Ancient Monuments and Archaeological Areas Act came into law in 1979) suggests otherwise. Responsibility now falls partly with the Scottish Executive and Historic Scotland to reaffirm the bings’ monumental qualities, and reintroduce into the narrative, Latham and Steveni’s notable role in safeguarding Five Sisters and parts of Niddrie Woman as Scheduled Ancient Monuments. Niddrie Woman and Niddrie Heart—are remarked upon from time to time as footnotes of a legendary event in the occasional annals of Scottish art. Writers on Latham do not usually regard a visit to these sites to be necessary. This seems neglectful, but is simply indicative of a lack of contemporary advocacy and ‘their relative invisibility in earlier scholarly works’. Although Niddrie Woman does appear in Latham-focused publications, particularly John A Walker’s exemplary John Latham: The Incidental Person—His Art and Ideas’, 1994, and Chrissie Iles’ catalogue The N-U Niddrie Heart, 1992, it does not automatically appear in major chronologies of post-war Scottish art, or as examples of Land Art anywhere in the western world. Somehow the bings’ epic scale has, so far, eluded significant national or international recognition. Perhaps this is because the process of their re-conceptualisation should be located in the Duchampian tradition. However, it is difficult for this catagorisation to function at this scale and in such a defined socio-political context. Ready-mades are fundamentally art and autonomous objects —the bings are not always considered as either, being artworks only within a matrix of many other contexts. 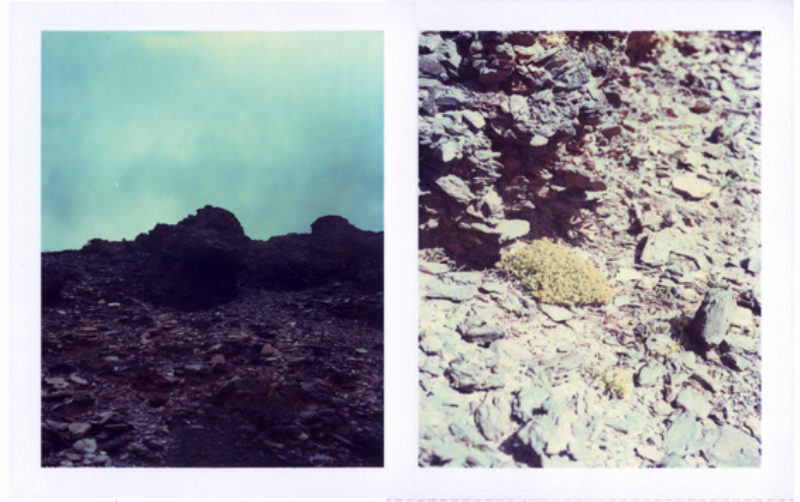 Conferring on them a collective sense of belonging to shared history, heritage, and memory, Latham sought to contribute to changing attitudes to the ‘natural’ environment and give the region a lasting monument to industrialisation as conceptual art. As such they have profound meaning. They throw a spanner in the works when viewed comparatively alongside typologies of Land Art or public sculpture. 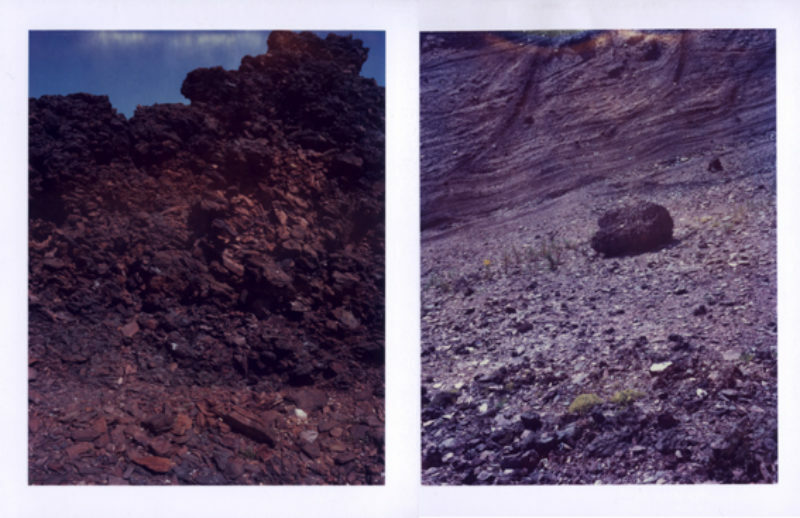 In scale they can be compared to isolated landmarks such as Michael Heizer’s ‘Double Negative’, 1969–70, interpreted and known through photographic modes, some aerial, some terrestrial, and reinvigorated through critical reappraisal. Latham went further than simply reflecting the economics and history of the region; he recognised the shale-bings as rapturous sites. Non-toxic weathered shale is formed through rapid oxidation, grey-blue turning red; that beauty can be found in such accumulated oxidised material is not unusual. The oxidation effects of Cor-Ten steel are also present in Richard Serra’s public sculpture and in Robert Smithson’s ‘A Sedimentation of the Mind: Earth Projects’, 1968, described as ‘Pulverisations; oxidation, hydration, carbonization, and solution (the major processes of rock and mineral disintegration) four methods that could be turned towards the making of art’. Or, in a more lyrical evocation, ‘Dump trucks spill spoil into an infinity of heaps… a devastating kind of primordial grandeur’. Progress and entropy. Artists such as Latham and Smithson have best understood the implications and anticipations of ways in which 20th century civic and regional communities could make use of transformations in the landscape, brought about by new or now redundant energy production technologies. In the 21st century is there a more pressing issue in the Scottish contemporary landscape at this time? Unpredictably, the bings, far from being sites of ecological devastation, now hold an important environmental and social value. Barbra Harvie’s ‘West Lothian Local Biodiversity Action Plan—Oil Shale Bings Report’ of 2005, proposes that they ‘are a unique habitat, not found elsewhere in Britain or Western Europe’, a vital recreation area and ‘a focus of community identity’. She maintains that for such a unique habitat, ‘the best management of oil-shale bings is no management’. It correlates with Latham’s own study describing a magical place—‘hares, red grouse, badgers, sky larks, foxes, and showy species, mainly butterflies’ and ‘a first recording of a ten-spot ladybird in the county’. These habitats are ‘island refugia for wildlife’ with considerable diversity of very rare and nationally scarce plant species. Astonishingly, over 350 of the 800 plant species in West Lothian are found on bings covering only 4% of West Lothian’s landmass. Latham’s commentary and the conjoining of mythology and conceptualism in his ‘Feasibility Study’ is a heady brew. As Douglas Crimp notes (describing Richard Serra’s works) in his essay ‘Redefining Site-Specificity’, ‘the place where the sculpture would stand would be the place where it was made, and its making would be the work of others’. Let’s not forget that the primary process—mining of oil-bearing shale—lit the Victorian mind and provided one quarter of London’s lamp oil. Latham’s arguments were against any associated shame. Through his initial advocacy, a few of these enormous bings have been preserved, although not yet fully recognised as art. ‘The idea hasn’t got across yet—sculpture is better than heritage’, he said. That Niddrie Woman and Five Sisters could be a conflation of both heritage and art requires further reaffirmation of them by civic and governmental authority as places of ‘natural’ wonder which might inspire other artworks to come into being. In the last year of his life, Latham considered re-conceptualisation of the bings ‘still a proper project to complete’. He recognised that constituting and confirming raw material as sculpture is not the same as putting it into relevant condition for public use, but then Latham was never predictable, always looking for new criteria. Plans of his schemes for the bings, particularly ‘Handbook of Reason’, were prominent in his London studio soon after his death. And as if to underline the importance of these sites to him, his ashes were scattered on the mined red shale of Niddrie Heart, the site he documented in 1976. And as for today’s visitors to the bings? Niddrie Woman is an unkempt warren of scrambler bike tracks and stolen cars—a lonely sanctuary. Websites invite gatherings and devastation by Land Rover. Niddrie Heart is currently being mined top down, and is closed to the public. In February this year, I hitched a lift on a monstrous mining vehicle and gained access to its crater. The perilous rim affords distant views towards Niddrie Woman and Edinburgh Airport. Looking inward—a scene worthy of Mars depicted in science fiction cinema—the grandeur of its devastation is a profound metaphor for centuries of industrialisation. Just beyond visibility, some miles west, looms Five Sisters on a plateau surrounded by farmland, light industrial developments and the redundant Freeport Leisure Village, all emphasising a melancholy effect. Each of the sisters offer a memorable ascent and descent, their sharp summits and sheer drops containing a readily evident diversity of wild flowers and other fauna within an atypical Scottish landscape. The emblematising of Niddrie Woman, her Heart and Five Sisters through further visual documentation and civic investment as visual art, is necessary and evolving through internet photography sites, a trail of disparate art articles, and art students’ real concern for the genuine article. Latham recognised the bings’ continued value for other artists, concluding ‘There is a Work in the interpretation of the Work’. His ‘Feasibility Study’ and the subsequent events provide a compelling example of an artist’s recorded influence, without any loss of artistic autonomy, in political decision-making of regional government. His study is an opening argument, bringing those unspeaking earthly masses into the mind of the viewer in a unique way. While his proposals and the placement’s radicalisation of site-specificity is little acknowledged—the truth is out there.